How many episodes of Dead Like Me have you seen? Q: Why did they take Dead Like Me off the air, after its second season? My place is in front of the TV every Sunday night to WATCH! Finally a show I can watch and get interested in. 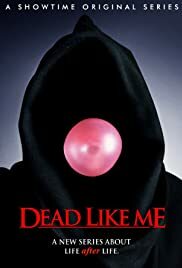 Dead Like Me continues to intrigue me through great acting and well written scripts. The whole reaper thing seems to be a sub culture; go to the message boards. There are back and forth discussions about minute details, as if the reapers are real. They aren't, but one can still empathise with these "dead" people. As each reaper grows through life situations (usually sticky) the viewer grows to like each character even more. Mandy Pantinkin adds a wonderful balance to the whole cast. His character Rube fascinates me. He is secretive, yet he opens himself to emotional attachments with the reapers he "manages." Each of the reapers have their weaknesses and strengths, but like the viewer, they discover them through the crazy situations they find themselves in. Its on late Sunday night, I'm on the West Coast, but I don't care because the show is the highlight of my Weekend TV viewing. Watch it once and you will be hooked!